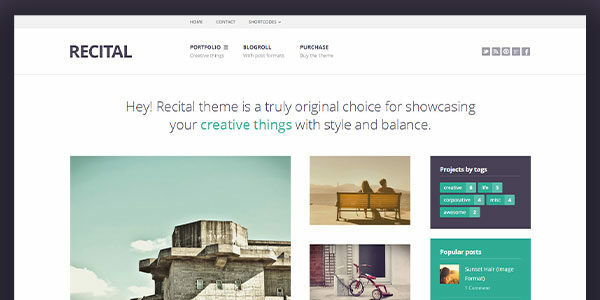 Recital is a theme by Strict Themes aimed at bloggers, influencers, or artists, but will also be an excellent choice for anyone looking for a functional and streamlined WordPress theme. While it will fit many scenarios, the theme’s primary purpose is to showcase your creativity without distractions. The included dummy content will get you up to speed quickly, so you’ll get to know the theme’s possibilities in a matter of minutes. After installing the dummy content, tweaking and updating the theme is easy. The Theme Panel interface is polished and functional. The concise, tab-based interface logically organized, so you won’t have to hunt down settings. You won’t have to spend a lot of time here, because once you’ll set up your theme, everything works just as you’d expect. Anyway, the styles can be customized with a virtually unlimited number of colors, and you can add custom styles on standalone .css file without needlessly overcrowding the header of HTML document. The theme comes with support for HiDpi displays, so your media content will look equally stunning, no matter the device. Obviously, the theme is responsive and optimized both for widescreen displays as for smartphone screens. Recital includes three templates for blog pages and unlimited sidebar areas for the homepage, posts, pages and portfolio projects. 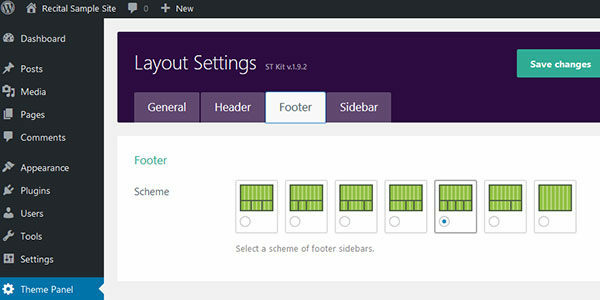 Sidebars can be individually customized for different parts of your site. The predefined sidebars are more than enough for typical usage scenarios. 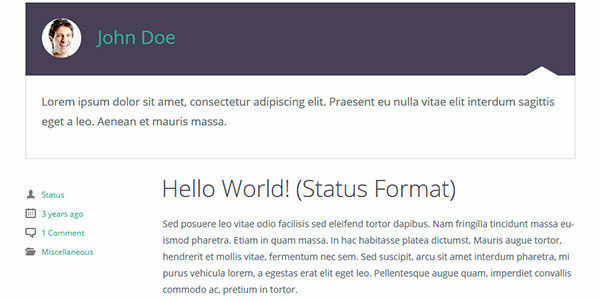 Additionally, you can add custom sidebars for any post, page and project. For example, you may want to include a sidebar with your Flickr page as a photography showcase and a download sidebar for musical experiments. For an immersive experience, you could avoid using the sidebars altogether. The theme comes with two menus. You’ll want to use the secondary one to display navigation elements for quick navigation and the main menu to showcase your portfolio. With the main menu you get some built-in social icons covering most social networks and services you may want to use. In addition to that, you can add custom social icons with ease. In the footer area, there are seven layouts to chose from, so you can adapt them to your needs by adding quick links, a contact form, a map and even graphic content. As you would expect, the logo can be both text or graphic. 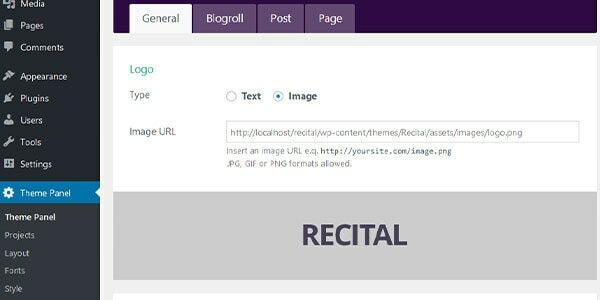 With Recital, you’ve got all you need to promote your brand, guide users on your website and build a social following. For a theme geared to bloggers and artists, typography is essential. 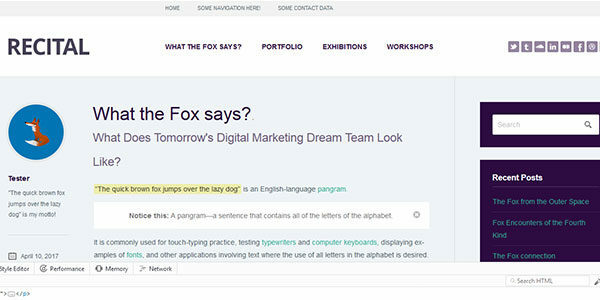 The author is following key typography principles in a balanced and legible manner. If the default fonts don’t suit your needs, you’ve got more than 600+ Google Fonts to choose from, for a distinct and unique look. And that’s not all. The author bundled all the shortcodes you need to deliver content that stands out. 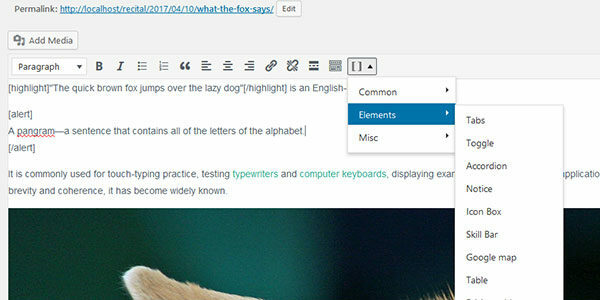 There are shortcodes for columns, drop caps for creative posts, accordions and tabs to keep your content organized, tooltips, alerts, notices or highlights to engage with users. Furthermore, the theme comes with 100+ pixel-perfect glyphs, that can be used for beautiful visual experiences. The built-in portfolio layout comes with a neat lightbox plug-in to showcase graphic content. Recital is not only a beautiful theme, but it’s also exquisitely elegant. For example, the “nice date” feature will display dates in an artistic way, without the dullness that comes with standard date formats. It’s a subtle feature but adds classiness to posts. In addition to great typography, you can choose to add subtitles to post, page and project templates. It’s an attractive feature that will add a personal tone to projects, and, it will also boost your SEO score. By the way, the theme is built with clean, semantic, and search engine optimized HTML5 and CSS3 code, that will improve tour search engines rankings. It’s also optimized for Google Analytics, so you’ll get all the data you need to tweak your site and react to your visitors’ trends. Strict Themes designed Recital to be universally accessible. It comes with a .po file containing the theme’s text strings so you can translate the theme for the audience you are aiming at. All in one, Recital is an excellent package. But does it work? Recital comes with readable code that favors customizations. It follows the best coding practices, with the theme being compatible with W3C standards. It’s fast and lightweight. The CSS styles care structured by the book and are well-commented. 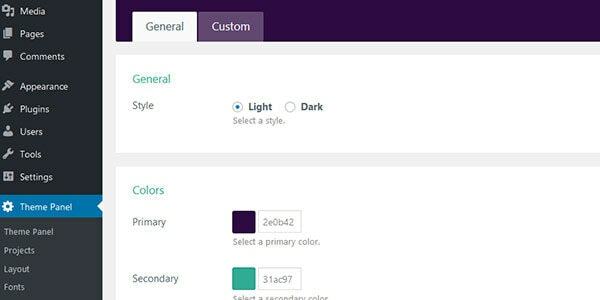 You’ll spend more time customizing and tweaking styles instead of deciphering code. The author keeps Extended Documentation to help you get the most from your theme. In addition, Strict Themes will help you solve any miscellaneous issues you may run into. Found a bug? The author guarantees that a fix will come as soon as possible. 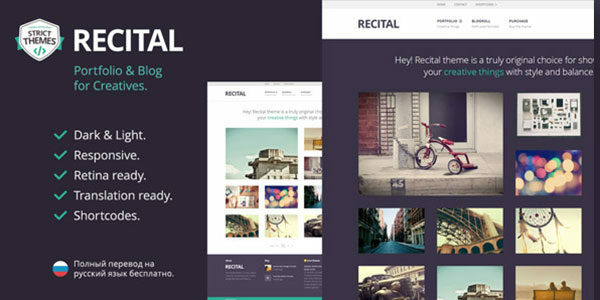 Recital is compatible with most plugins available, and the theme runs great even on beta versions of WordPress. That’s why you won’t have to worry about incompatibilities when updating your WordPress environment. The built-in one click updater will take care of the upgrade process. You should also know that switching between development to production is easy. The theme settings can be easily exported and imported on a fresh installation or between environments. 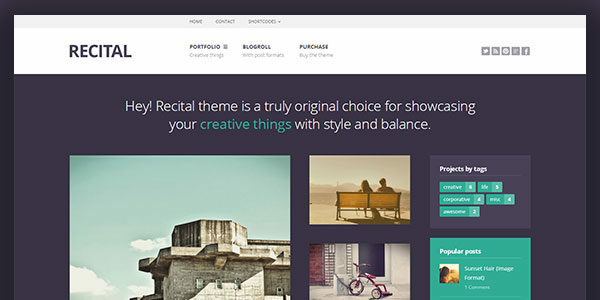 Recital is available on ThemeForest for $39. 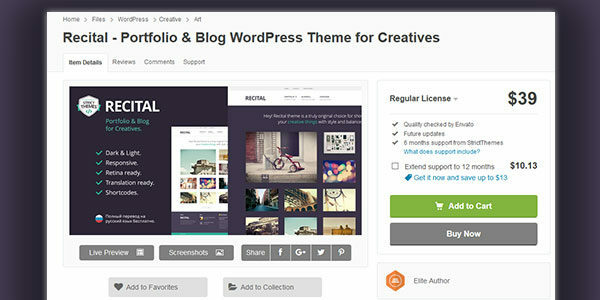 It’s developed by an elite author, with a portfolio of more than 15 WordPress themes and more than 10 years of WordPress experience. It’s vibrant, functional and elegant. Just what you need for your blog.